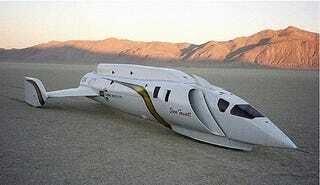 Before his death in 2007, adventurer Steve Fossett was readying an attempt to break the land speed record of 763 mph, using a vehicle from famed designer Craig Breedlove. Mothballed for two years, it's now up for sale. Dubbed the "Spirit of America – Sonic Arrow," Fossett and crew were preparing for the first test runs of the vehicle when Fossett disappeared over Nevada, targeting at least 800 mph. Sporting a General Electric J-79 jet engine capable of generating 18,400 lbs. of thrust. While it looks like the world's fastest tricycle, the Sonic Arrow has a pair of narrow wheels up front to minimize drag while providing the stability of four wheels. The sellers claim Breedlove was able to get the vehicle up to 675 mph, and that further enhancements have raised the car possible top speed to 850-900 mph. The asking price, which starts at $3 million includes not just the car, but all the tools and support vehicles necessary for a top-speed run, including a "catering transporter." And like all custom car hawkers, the ad mentions how much has gone into the project so far: $4 million. Given that the current land speed record holder is gearing up for a shot at 1,000 mph, Fossett's last shot might need something more than willpower to get rolling again.